With temperatures crossing the 35 degree Celsius in February itself, the city seems to be headed for a harsh summer. BENGALURU: With temperatures crossing the 35 degree Celsius in February itself, the city seems to be headed for a harsh summer. Already, watermelon and tender coconut sellers seem to be doing brisk business and expect sales to increase further post the Shivaratri festival on March 4, when the summer months traditionally begin. Several vendors say the price of fruits like watermelon or coconut has been rising steadily. Most say their sales have gone up by 75 per cent. Currently, the price of tender coconut starts from `20 and goes up to `35 depending on the size and water content. 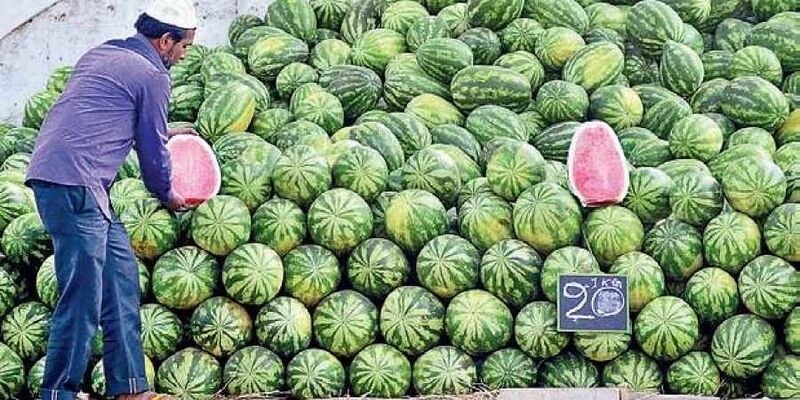 Watermelons are sold at `20 per kg. This is also expected to increase too. Aarumugam, a vendor at CBI Road, said, “The rates of will increase in a few weeks which may slightly decrease the sales. But we still manage to make a profit during the summers. Now I sell tender coconut at `30 which may increase to `35-40 next month.” Sellers claim that the better coconuts are sold at higher rates during summers as they usually are brought in from other districts. However, watermelons are likely to be sold at more or less the same price. vendor at R T Nagar. Vinod Kumar, another seller from J P Nagar, said coconuts from Maddur are preferred by people as the trees are irrigated by Cauvery backwaters and have a sweeter taste. “But bringing the nuts from there is expensive. I buy 1,000 coconuts for a week paying money to my assistants. Dealers get a discount of `3 from the farmers but we have to pay the entire amount and the rate increases as summer begins,” he added, justifying the price hike.